Japanese maples provide fiery colors—such as orange, gold, scarlet and yellow—to the landscape all year long. They also have many different shapes, including weeping or mounding and dwarf and upright. Most Japanese maples flourish in full sun, while others prefer a dappling of sunlight and do well in shaded areas. At maturity, Japanese maples may well grow over 30 feet in height for a brilliant presence. This deciduous tree has low branches and a round form that grows between 30 and 35 feet in height. Its leaves are oval in shape and bright green in the summer months. During the fall, the leaves turn yellow to red for a brightly colored tree. Young Japanese stripped-bark maple trees have green branches with white stripes running down the middle, hence the name of this Japanese maple variety. The pendulous-shaped flowers on the Japanese stripped-bark maple are white and grow up to 4 inches wide. This hardy tree prefers full sun to partial shade and well-drained, moist soil. The USDA hardiness zones are 5 to 7. 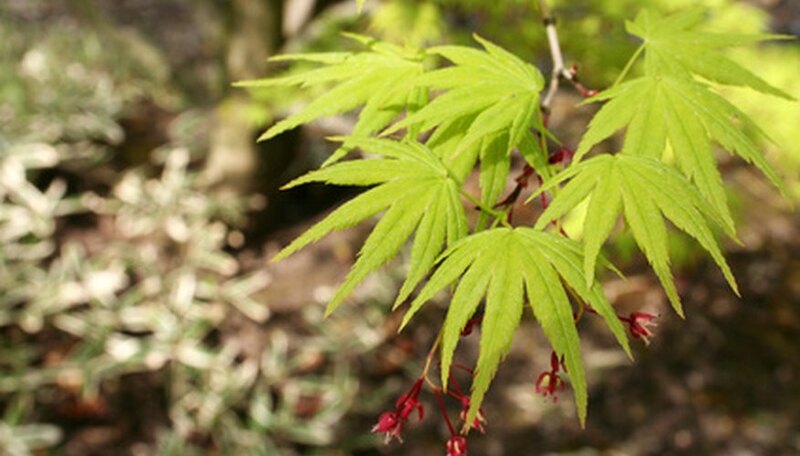 The threadleaf Japanese maple has a mound-forming, cascading shape with finely cut leaves. The leaves have a golden color in fall and tiny purplish red flowers that emerge every summer. This moderate grower requires moderate moisture and full sun to partial shade to thrive. Threadleaf maples grow up to 10 feet tall and wide and look striking along a front yard for a colorful focal point to the landscape. Grow these trees in large containers to situate along a patio for fiery fall color. Graft them to create bonsai, or use small Japanese maple trees that mimic the proportions of mature Japanese maple trees. The USDA hardiness zones are 6 to 8. This striking variety of Japanese maple grows up to 15 feet high and wide for a commanding presence to the landscape. Beginning in the spring, the foliage appears bright pink to slowly change to a pinkish melon color. At the start of the summer, the foliage is a distinct amber color with a contrasting green vein that runs through each leaf. The upright form and showy foliage of the amber ghost Japanese maple adds stunning color to a front yard or backyard garden border. These moderate growers prefer semi-acidic, well-drained soil—and also requires consistent watering and protection from the afternoon sun. This hardy variety is frost tolerant. The USDA hardiness zones are 5 to 8.